Welcome To Cork Lane Decorating Center! Welcome to Cork Lane Decorating Center a total decorating home improvement business for over 30 years! At Cork Lane you will discover competitive pricing alongside unbeatable service. Creating outstanding home decor service since 1979, Cork Lane Decorating Center has been decorating homes in Western Michigan for over 30 years. Dian Latora, the founder, has unwavering dedication to customer service, quality and professionalism. Her personal dedication to excellence has made us the decorating destination for families all around western Michigan and the greater Kalamazoo - Portage area. Your experience here will be unforgettable. Invite Dian to your home to help you transform it into a unique and personalized expression of you. Custom window treatments are our specialty. 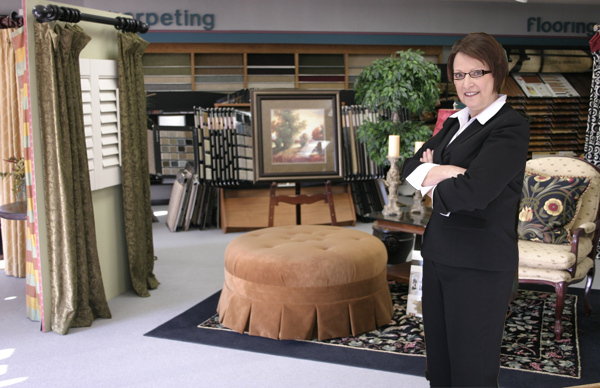 She will help you with designing the best solution for your home, something the box stores just can not do. Whether it be draperies, blinds, or flooring, quality paint or furniture, Cork Lane Decorating does it all from floor to ceiling! Contact us for a free in-home consultation or visit our showroom for ideas and inspiration. Cork Lane Decorating Center offers an extensive collection of fabric selections for window treatments, furniture, bedding… anything you desire. We also offer a wide selection of wallpaper, blinds, flooring and accessories. Our devoted clients have become an extension of our Cork Lane Decorating Center family and value our superior service and commitment to total satisfaction.